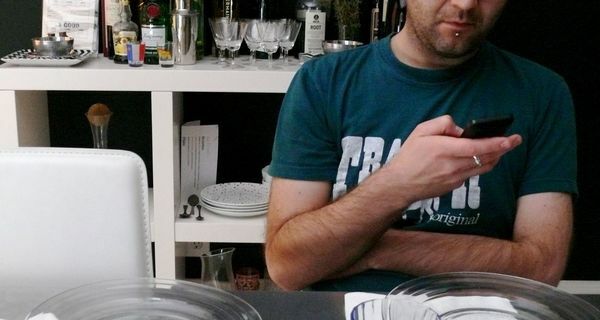 Well it’s about time I featured James (my partner, best friend, co-cook and, to get all cute about it, my boyfriendxoxox) in a cook love post. 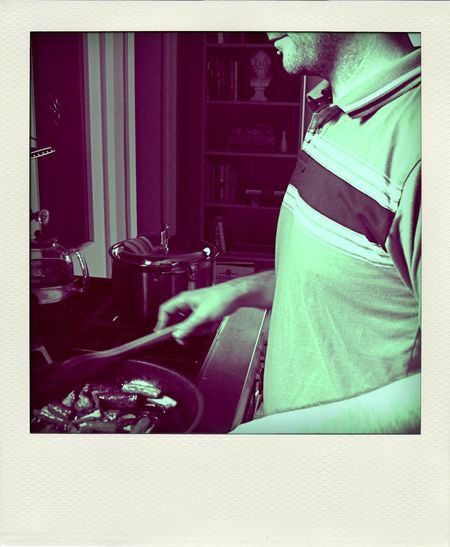 I eat most of my meals with him and in fact, he cooks many of the meals I eat. We share all of the work in our home He does the lion’s share of the work in our house and if you think I do all of the cooking just because I run this site, you’d be mistaken. Counting multiple recipe tests, I cook a lot more than he does, but James gets about half of our dinners on the table and our lunches done for the next day. James doesn’t follow recipes, at least not by choice, and he puts up a fuss when I make him write his creations down for me. (Click on the images below for his recipes on le sauce.) He hates washing herbs, especially cilantro, and while he gets easily distracted by squirrels in our backyard that he glimpses from our kitchen window, he can get everything from our ritualistic big weekend breakfast to dinner for 8 on the table in rapid time if he must (you have to check out the time I documented this live one night). But the main reason I coaxed him into being featured in this installment of cook love (and it did take coaxing–he’s internet-shy, hence the “man of mystery” photo cropping–his words) is because he’s an inventive cook whose meals impress, inspire and in many ways influence how I cook and eat. Here’s more about James at the table and beyond. What are your favourite 3 ingredients? How do you come up with unique combos like Dijon + paprika in your famous winter stew? I was using paprika because I wanted it to be goulash-y and then it wasn’t thick enough so I added mustard to try and thicken it. All of my cooking happens that way. If something’s not right, I just (tweak) it to make it work. Is there a cuisine that you’d like to perfect? Or something you love to eat and don’t make and wish you could? No. Some things are better when other people make them. You don’t have to make everything. Why do you hate onions so much + tell the truth, when don’t you mind them? Tell me about one or two of your early childhood memories–they can be food-related or not. I remember running around barefoot on Grammie’s front lawn and stepping on a red anthill. That’s when I learned about fire ants–or what I assumed were fire ants. Not sure if they were or not. If not in Toronto, where would you live? Winters in Cuba, summers in Budapest. You’re having a nightmare, you’re walking down a dark alley. What awaits you? What surprises you about yourself today vs. 5 years ago? If you had to create an ideal/favourite meal? Depends. It could be my special Kraft Macaroni and Cheese recipes which are too secret to share. Or good mashed potatoes and gravy–alternatively, poutine. What else would be on the table? Eggplant dishes of every kind. Probably some Thai basil eggplant and some Sri Lankan eggplant curry. Eggplant Parmesan. Real light. Some salad to balance it out. Any favourite art of any kind to share? Can’t pinpoint a certain thing but the art that I’ve been consuming recently is comic book art. I reread the Teenage Mutant Ninja Turtles first issue and it’s a black and white animation–really good animation. And The Walking Dead comics are really good–black and white too. I was reading Allan Watt’s The Spirit of Zen and it has cool drawing and paintings from ancient China–monkeys and stuff. Those were really good but I don’t know who the artist is. Great post. I have always been too scared to go “off book” even though I know that I just have to dive in and make mistakes in order to really learn to cook. 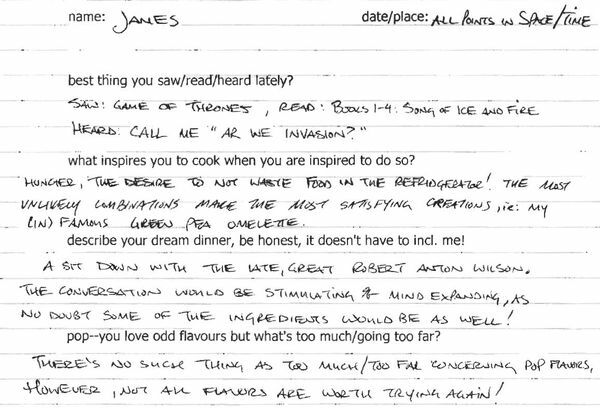 James is a real inspiration for me to eventually ditch the recipes. Thanks. Love this post! You two are so awesome. Love being part of your food (and other) adventures! What a cutie pie. Pinch his cheeks for me. I’ll leave it to you to decide which set of cheeks.